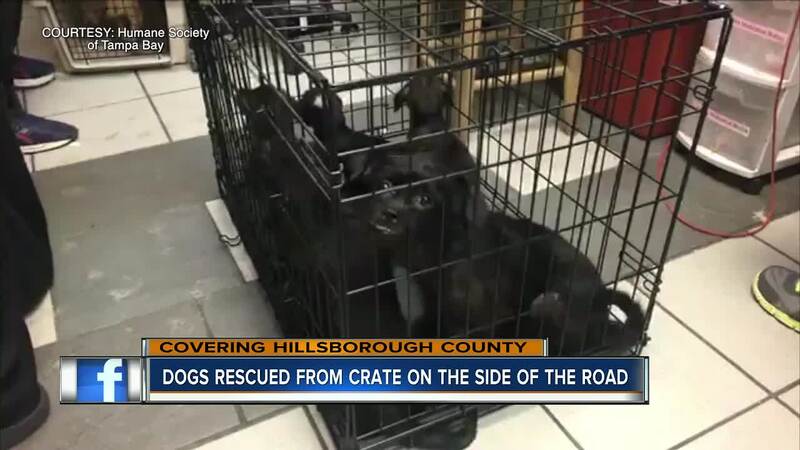 TAMPA, Fla. — A FedEx driver found an abandoned crate of puppies on the side of the road on Monday in Hillsborough County. When the driver spotted the crate, he pulled over and saw that it was stuffed with seven dogs. Two of them were adults, the other five were puppies. The driver took the dogs to the Hillsborough County Animal Shelter but quickly realized they are closed on Mondays. A Good Samaritan offered to take the dogs home, bathe them and bring them to the Humane Society of Tampa Bay, where the dogs are now. The puppies are believed to be a Chihuahua and terrier mix. The dogs were found in a black metal crate. Officials say that the dogs could have died from the heat, having been left in the crate on a hot summer day in Florida. They are now looking for people to foster the puppies for up to 3 weeks. The Humane Society wants to remind people its illegal to abandon dogs.